Join Kombucha Fuel, Slow Food BU, Boston Localvores, and The Urban Homesteaders' League for a potluck and demo on how to brew the fermented tea kombucha! This workshop will include a potluck, so bring a dish if you can, and remember to bring your own plate and utensils so we can reduce our waste. Traced back to Chinese origins to around 220 B.C., numerous health promoting and detoxifying effects have been attributed to kombucha, also referred to as the "elixir of life." While kombucha often costs $3+ a bottle, it is very inexpensive and easy to brew your own! I will demonstrate and explain the basics of brewing and bottling kombucha. Topics to be covered include required materials, the traditional and continuous brewing methods, how to grow your own kombucha mushroom, and more. Samples of home brewed kombucha tea will be available to taste (look forward to raspberry jasmine kombucha tea, ginger darjeeling kombucha tea, and more). SCOBYs will also be available for individuals to take home. For those interested in adopting a kombucha mushroom, bringing a clean, glass pint jar would help to facilitate distribution. For those of you who already brew kombucha, consider bringing any extra kombucha mothers you have to spare, or bringing your own kombucha so we can do a taste comparison! I've touched on this topic before, but thought it was a subject worth revisiting. What do you do with all of your extra kombucha mushrooms? If you are brewing using the continuous method, extra SCOBYs may not be a concern. But if you are brewing traditionally, you may have more kombucha mothers than you know what to do with! I usually have two kombucha mushrooms going per brew container, and the number of kombucha mushrooms you can have fermenting per container can vary depending on personal preference, the size of your brew, and the size and thickness of your kombucha mushrooms. You don't want the mushrooms to get too crowded, so experiment with what works according to your SCOBYs and brewing vessel. To keep or not to keep- I've found that the younger mushrooms (which are the lighter, more cream-colored ones that form at the surface of your brew) and the mushrooms with a more uniform thickness tend to perform better. So keep your preferred mushrooms for brewing, and for extra mushrooms that you need to find another use for, read some of my suggestions below. It's the perfect time to experiment with your extra kombucha mushrooms! Try different sweeteners, such as honey or maple syrup, or try herbal, flavored, or exotic teas. How about coffee kombucha? (Coffee kombucha links here and here). Give extra kombucha mothers to your friends and spread the kombucha love! Store extra mushrooms in the fridge in a "kombucha hotel" for backups or to distribute later. Ever tried eating a SCOBY? -Eating a kombucha mushroom by itself is not something I would probably do again. However, you may try cutting it up and sprinkling it on your food, or use it as a garnish. Alternatively, my friend suggests blending up kombucha mushrooms into smoothies. Happy Herbalist lists many creative ideas and recipes for what to do with extra mushrooms, including making "drum heads and leather craft[s]!" What do you do with your extra kombucha mothers? As I was washing the dishes one day, I heard a slight crack. I looked around the kitchen but didn't notice anything...but soon the smell of kombucha filled the room. Uh-oh. It turns out, a bottle of my kombucha had exploded- as a kind reminder not to leave your kombucha bottles out for too long for a second fermentation. I have been fortunate to have never had a bottle of kombucha explode on me before this day, and after brewing kombucha for over a year, I guess it was about time. Luckily, the explosion was a lot less dramatic than it could have been. When I first began bottling kombucha, I had been nervous about shards of glass ending up on on my wall. 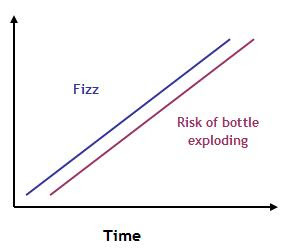 Beer bottles with their narrow necks and tight caps are ideal for creating fizz, and the longer you leave your bottles out for a secondary fermentation, the more fizz will build up. HOWEVER, if you leave your bottles out for too long, and especially with such tight seals, you run the risk of them exploding. Some people recommend 1-2 days for a secondary fermentation, others 3-4 days, and some recommend even longer. It all depends on various factors, such as temperature (higher temperatures = faster fermentation). My advice: If you're fermenting a batch, try a bottle after 1 or 2 days (more or less days depending on previous experiences, etc.). Then decide whether your other bottles are ready to refrigerate, or if they could use some more time fermenting. If you can hear your kombucha bottles at room temperature fizzing, refrigerate it!! -Read this discussion thread on bottling technique from some fellow kombucha fermenters. According to this thread, flip-top beer bottles can be a good option, because the rubber seal releases some of the pressure that may cause your bottle to explode. Adding to my list of broken kombucha bottles includes one instance when my refrigerator somehow got to freezing temperatures, causing the kombucha to freeze and expand (when water freezes into ice, the volume expands as the molecules form a crystal lattice), causing another kombucha bottle to break. Home-brewing (and in fact, brewing in general) is never perfect. Accidents happen, but they are all part of learning how to brew and how to perfect your technique, and make your home-brewed kombucha that much more worthwhile. What interesting kombucha experiences have you had?